YouTube and Facebook are trying to stop the spread of the Tide Pod Challenge, a bizarre and dangerous phenomenon in which social media users eat laundry detergent packets on camera. YouTube, which is owned by Google (GOOGL), says it's taking down clips that show people taking bites of the pods. The videos have become an online craze among teenagers, prompting widespread health and safety warnings. "YouTube's Community Guidelines prohibit content that's intended to encourage dangerous activities that have an inherent risk of physical harm," a Google spokesperson said in a statement. "We work to quickly remove flagged videos that violate our policies." Facebook (FB) has also removed posts from its platforms, including Instagram. A company spokesperson told CNNMoney that "we don't allow the promotion of self-injury and will remove it when we're made aware of it." For years, children have inadvertently eaten the toxic packets, leading to accidental poisonings and calls for parents to keep them away from their kids. Some say the products can be mistaken for candy. 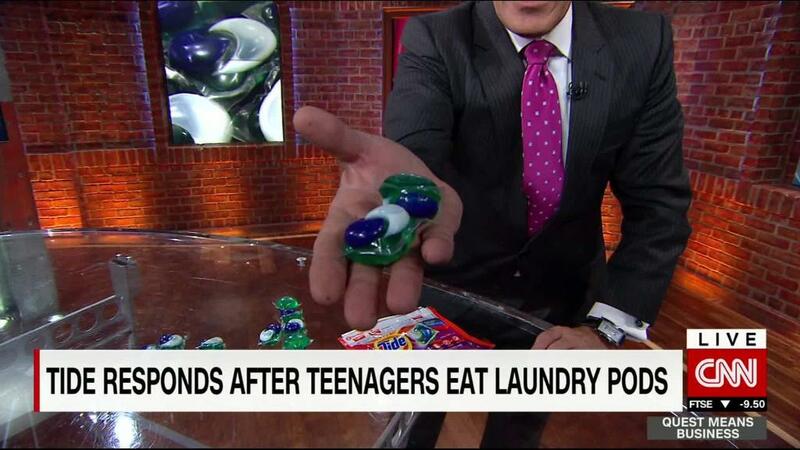 But in recent weeks, the #TidePodChallenge hashtag has exploded, leading the American Association of Poison Control Centers to issue an alert. In the first 15 days of this year, the organization received the same number of calls about "intentional exposures" to laundry packets among teenagers as it did in the whole of 2016. "A recent trend among teenagers ingesting the packets -- and uploading videos to various internet platforms including video-sharing websites, social media, and vlogging platforms -- has caused significant concern among poison control centers," the association said Tuesday. Tide's parent company, Procter & Gamble (PG), told CNN in a statement that "nothing is more important to us than the safety of people who use our products." "We are deeply concerned about conversations related to intentional and improper use of liquid laundry pacs and have been working with leading social media networks to remove harmful content that is not consistent with their policies," said a company representative. It's unclear how the craze started. Some reports suggest the idea grew out of online memes joking about how appetizing the pods looked. P&G is hoping a celebrity will help make a difference on the issue. Over the weekend, it enlisted NFL star Rob Gronkowski to appear in an official Tide video that gained millions of views on Twitter. "What the heck is going on, people? Use Tide Pods for washing. Not eating," Gronkowski tells viewers. Google says that in addition to removing the videos, users who post clips of themselves or others doing the Tide Pod Challenge will be given a strike on their YouTube channels for violating content rules. Its pledge to clamp down on the videos comes as the company takes further steps to police content. This week, YouTube said that it would assign workers to "manually review" its most popular videos after a controversial clip by Logan Paul, a famous blogger, violated guidelines. -- Sherisse Pham contributed to this report.